NB: See learning outcomes for this tutorial mapped to competencies. Pharmacists are trained as scientists, so 'logically' we might anticipate that people will listen to us when we have something important to say. But it is not as simple as that: successful communication has more to do with the way we communicate with others, rather than the message itself. This tutorial is mainly an introduction to how we can communicate more effectively and we’re starting with meeting people face-to-face. People prefer speaking face-to-face. This is because we feel more able to build a relationship with someone and influence them when we can see them; there’s less risk of being misinterpreted too because we can gauge people’s responses more easily. Why is this? Research shows that over 90% of communication is non-verbal. It’s not what we say that influences people the most, but how we appear and behave (body language), and how we speak. These vital non-verbal clues are lost when we email, text, or phone someone. Watch some people who are good at conversation or who communicate effectively. What gestures do they use? How do they stand? Do they use their voice in particular ways? How do these good communicators compare to others who are less good at it? You can learn a great deal by ‘people watching’. Try it! 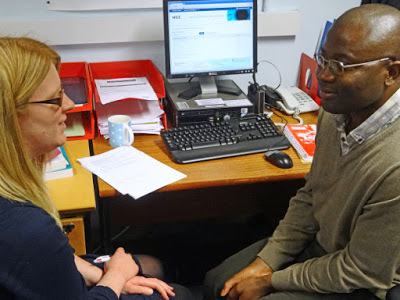 Consultation skills for pharmacy practice has been developed with Health Education England to support pharmacy professionals in developing patient-centred consultation practice. It presents a 6-step learning and development pathway with useful tools and resources to support personal reflection, learning and assessment. There are other consultation-based resources on the CPPE website: Consultation skills (foundation) and Consultation skills (advanced).